The Construction Master can be used as a stair calculator, to figure rafter lengths, squaring walls, and many more uses. In addition to the special purpose uses already mentioned the construction master can also perform the functions of a regular calculator. This is the handiest stair construction tool to come along since the framing square. Accurate to within 1/16th of an inch it will greatly speed up and simplify the math involved with stair layout. After entering the values for total rise, run, and desired riser height the construction master will accurately and quickly display the following information. By default the desired riser and tread settings are set at 7 1/2" and 10" respectively. The desired riser height can be reset to a new height if you need it for a special set of stairs such as the type used in nursing homes. Lets say you need to build stairs with a 5 1/2" rise to reset the desired riser height you would use the following key strokes to enter the new default setting for the calculator. Press 5, inch, 1, /, 2, stair, and the calculator window will display R-Htm 5 1/2. This tool really is that easy to use. 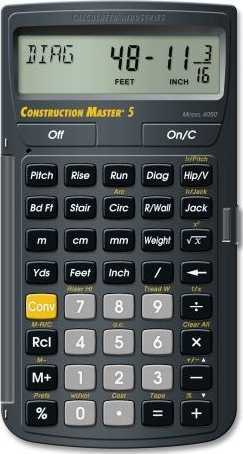 Get a free 30 day trial of the Construction Master calculator for your PC. Sorry MAC users, this is only for windows. This is merely a small sampling of the functions of this calculator. It is truly the best carpentry tool since the invention of the electric saw.